"I like that Wookiee" - a Chewbacca thread.. I haven't seen a thread dedicated to Chewie.. so thought I'd go ahead and start one.. I'm wondering how you all see Chewie's story arc moving forward. How you think his character will be utilised etc. Is it just me or was he quite under developed in TLJ? given the events of TFA?! I'm wondering what's going to happen with him and the MF now.. is it his ship? Who actually owns it now? What would happen to his character if Rey and Ben fly off into the sunset with the MF?! What role can his character play moving forward? Do you think he could be a great lampshade for the Ben/Rey relationship?! Do you think Chewie will survive IX? If we can't see Ben reconcile with Leia, non-FG Luke nor Han in IX- the one remaining living connection to his past is Chewie. This could be super important maybe? I think JJ learned from his mistake at the end of TFA - having Chewie run right past Leia the first time he sees her after Han dies was a big boo boo.. I don't think JJ will be making that kind of mistake again! I could see them deciding Chewie could sacrifice his life to save Ben - showing that he had accepted Ben's redemption at that point and fully forgiven him..
or... with Chewie being covered in hair and able to be played by another actor - do you think they'd keep him alive to be in future SW movies?! Re: "I like that Wookiee" - a Chewbacca thread..
You know what I’d like to know? How OLD is Chewie now? He must be a pretty easy going guy. I mean, he smiles at Rey at the end of TFA on the Falcon (right after Han dies) and then takes Rey to meet with the his murderer in TLJ. I’d like to see the scene where Rey asks him to drop her off near the Supremacy so she can meet with Ben and hopefully bring him back to the Resistance. I think Chewie will survive beyond this trilogy. Like, he just FREAKIN lost his best friend/brother/soulmate in TFA and all he gets to do is sit around and roast Porgs? Psshh. Chewie is about 234 yrs old around TFA/TLJ. Google says wookies typically live about 400 yrs..
Sooooo he still has some living to do potentially in the SW universe I guess! Easy going is right! The wookie is a saint! With all the characters that were focused on and developed in TLJ, Chewie got lost in the crowd.. and he didn't really have any arc other than being cross with Luke for a bit, looking sad and missing Han, and then grappling with eating porg in front of porgs. Aie. His character seems forgotten. I hope they really use him more in IX! I find I've been overlooking him as a character and hardly gave him much thought till only recently. Poor Chewie! @SheLitAFire wrote: Like, he just FREAKIN lost his best friend/brother/soulmate in TFA and all he gets to do is sit around and roast Porgs? Psshh. Chewie's character seems a little lost now Han is out of the picture.. I think we could have done with some kind of He's acknowledgement of Chewie's motivations and commitment to the resistance now Han has passed.. He's been a little taken for granted as a character, relegated to role of Rey's ever faithful backup and that we just kind of assume will be there.. I love his funny moments - but now Han is gone, I would like to have gotten a handle more on how he fits into the galaxy now.. it seems to be hinted at that he likes Rey - and maybe that accounted for his actions in TLJ? Does anyone have an interest in Chewie's character and a handle on all this? I can’t believe we didn’t have a Chewie thread, @DeeBee thank you for creating this! I agree that Chewie has been a little lost without Han. He has a family on Kashyyyk so I wonder if he’ll go home after whatever takes place in Episode IX. I hope he has a purposeful role in Episode IX and he’s NOT killed. I know it looks like Rey has inherited the MF, but I feel like Chewie has a right to it too. He should at least continue to be co-pilot until he decides to go home. I wonder if we’ll get a scene of Maz hitting on Chewie in Episode IX. CHEWIE! As you can see from my avatar, Chewie is an all time favourite. It made me smile to read that the fur on the Chewie costume didn't last as long as the prop people thought it would, as it seems one's would see Chewie on set and you've just got to hug him. My absolute worst fear is that they would kill Chewie off, Han Solo who I adored in the OT, I just about coped with being killed off, but had that been Chewie, I think I probably would have sobbed my socks off. I hope he plays more of a role in IX, I do think it's difficult with so many characters requiring screen time. I think I'd like to see Chewie and Kylo together ideally in the MF with Rey. We've already seen that Rey trusts Chewie and Chewie trusted Rey enough to belive in her reasoning when she posted herself to Kylo. I have this idea that offscreen they chatter away together. 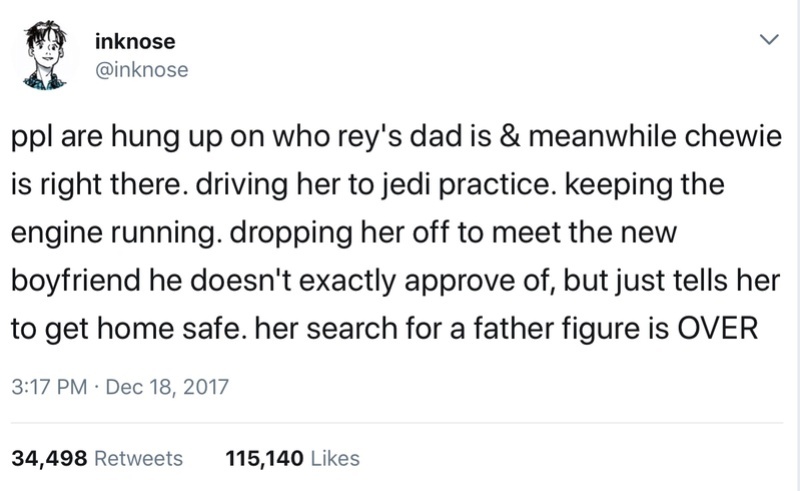 I view Chewie actually as more of a father figure to Rey too. @Kessel wrote: I can’t believe we didn’t have a Chewie thread, @DeeBee thank you for creating this! oh yeah! that Chewie is Rey's dad thing was awesome!! Oh rofl. a scene of Maz and Chewie haaa.. I think it works best left to the imagination.. but you never know tee hee.. I haven't seen Chewie in the clone wars -does he have a wife and kids? yeah I'm agreeing with you guys who don't want chewie to die - there is enough death, and he would be the only living character left from the original trilogy.. would be good for him to die in the following trilogy - rofl. I'm kidding! @Let The Past Die - ah yes your avatar is fantastic!! I agree here's hoping Chewie gets something more significant to do in IX!!! I'm encouraged that JJ is in charge of IX, and that he admitted how he had made a mistake overlooking Chewie at the end of TFA. I don't think he'll make the same mistake twice. got my fingers crossed..
Rofl @Teo oswald - yes Maz would agree with you there haaaaa..
Hey I wonder if Chewie could maybe recruit more Wookie's to the Rebel cause - to help bring down the FO? They could be the 'Hairy Battalion'! edited to add: Is it just me or would it be hilarious to see General Hux have to deal with Wookies? I always thought Chewie adopted Rey. He hurt Kylo for Han's death. Then he brought Rey from Kylo .... I think he's the only one who will recognize Ben if he goes with Rey in some way. I have the feeling that he is the only link with the past and will protect them both. In the end if Kylo Ren returns to Ben Solo, he is like Han. He always forgave Ben. It will be the father who welcomes the prodigal son. @giaciak2 wrote: I always thought Chewie adopted Rey. He hurt Kylo for Han's death. Then he brought Rey from Kylo .... I think he's the only one who will recognize Ben if he goes with Rey in some way. I have the feeling that he is the only link with the past and will protect them both. In the end if Kylo Ren returns to Ben Solo, he is like Han. He always forgave Ben. It will be the father who welcomes the prodigal son.